I’ll be honest with you. I can see the appeal of dogs and I really love the idea of them, but when I’m faced with a real dog I’m scared. Very scared. I always have been and unfortunately think I always will be. It doesn’t matter what breed or what size, until I get to know a dog I will be scared stiff of it. When I was a kid I used to beg our next door neighbour to let her dogs come and play with me in our garden and then I’d remember how scary they were and spend the rest of the afternoon at the top of the climbing frame too frightened to come down, while two shih-tzus bounced up and down below me. My brother would be rolling around on the floor crying tears of laughter at how pathetic and deluded I was. Things haven’t changed that much. If I’m on my bike and I see a dog off its leash, I’ll get off my bike and push it along until I’ve passed the dog. My husband will cycle on, shaking his head in despair and calling out a gentle reminder that the toy poodle busily sniffing another dog’s bum isn’t interested in chasing me. 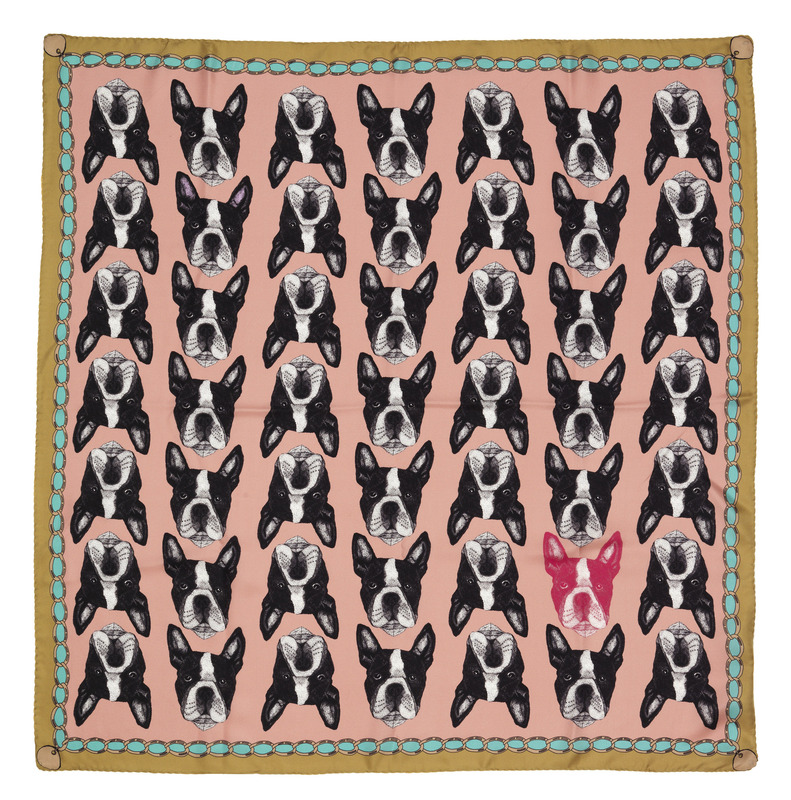 These Man’s Best Friend scarves by Lisa Bliss at The Graduate Collection aren’t scary at all. In fact these rainbow dachshunds couldn’t be scary if they tried. Look how sweet they look with their little stumpy legs. The dachshund scarves are available with nine dachshunds widthways in mink or rainbow or with one big dachshund lengthways in turquoise or pink. As the dachshund is long , the boston terrier is square and so is Lisa’s boston terrier scarf. Unlike real boston terriers you can choose from pink, yellow or green. I like that one head is picked out in a different colour. Lisa’s scarves are 100% silk, manufactured in the UK and are £90 from the Graduate Collection who champion new and emerging designers in the UK. There are also six fox head scarves to choose from. Until I can get over my fear of dogs, one of these beautiful scarves can be my dog substitute.